Duration: 1 hr. 33 min. Sakura Momoko's teacher assigns the third grade to draw an image based on their favorite song to enter a contest. Momoko loves a song she recently learned during her music class and is anxious to make a good drawing based on it. On her way to meet her relatives in Shizuoka, she meets Shouko Kimura, a university student who occasionally draws portraits at the local train station and plans to also participate in an art contest. Fascinated by her illustrations, Sakura meets Kimura once again. Shouko is enchanted by Momoko's sympathy and honesty. They quickly become friends and end up inspiring each other in their own way. Upon looking further into Masaaki Yuasa’s filmography, I noticed this chibi maruko chan movie, wich caught my eyes because I had seen some animation that reminded me of mind game. It was also greatly recommended by a friend of mine, note that you can watch it blind, as the series is mostly composed of gags and the characters stay very static and relatable without knowing exactly their origins. 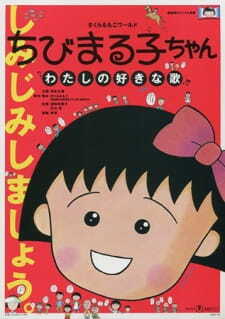 The movie starts with Sakura momoko also known as maruko-chan learning a new song, Menkoi kouma (beloved foal), she soon gets an assignment : to think of her favorite song and draw the image that comes to mind with that song. While visiting her grandparents in Shizuoka, she meets a street artist and will quickly become friends with her. and decide she could help in creating the best drawing for her song. This movie mainly tackles their growing friendship, how parting can be difficult and also questions our relation with art under the prism of a child. This movie is comprised of a lots of music clips which compose at least a big third of the movie as it is the main focus of the movie and they are also building its narrative. Upon her journey cherishing this song, she will realize that what she learned wasn’t the full version and will learn, with the help of different characters, the rest of the song and its context, giving it a different signification which also echoes with her relationship with the artist. Be it by her interaction with her grandfather who only knows the modified version when he was a child which may seem silly but shows how folk songs were created and transmitted and passed on to a new generation. Later in the movie, it reveals that the song was created in time of war and the horse was taken by the army to become a warhorse sent to a far-away battlefield, destroying the precious and happy image she had at first. It gets further with her boyfriend who is from Hokkaido and his family has a farm there and loved the song because of that, joy of birth, seeing the newborn foals standing up. Another major theme of the movie is saying goodbye to the loved ones, and the harsh reality of parting with someone, learn to cherish their memories tightly, and the storyline is simple enough to follow and still be emotional, it relies a lot on the viewer keeping the heart of a child and learn to appreciate all the little wonders in seemingly uninteresting events. Characters are kept simple and archetypal but them being that way doesn’t remove anything, in fact, that is its strength as it allows them to use empathy to its full extent. Maruko smug and naïve attitude, as well as her simplicity and her wild imagination certainly makes her adorable and relatable and her classmate all embodies one type of people we have encountered and are relatable in their own way. The way our two main characters evolve and progress throughout the movie is especially remarkable, it knows how to properly introduce them, how to foreshadow their relationship and just enough substance to make you sob at the end. One of the other highest point of the film is its art and direction, now the normal section use of an improved version of the series, having a beautiful and marvelous pastel art as well as its varied colour palette. Where it really shines though, are the music clips where every bit of care is put to make them as well crafted as possible. Every song has its own themes and atmosphere, be it visually or the music genre it tackles. The main song is presented differently from the clips present in this movie, it first start outs as a chorus sung by the children in the class. Then, you get to hear maruko sing it many times with a very smooth progression in how it is presented, either having it becomes an echo and having the reddish sun set as a background to symbolize nostalgia, or depicting the story of the song directly on screen and conveying the relation of the foal with his mother in a quite endearing way. Even after that, even though it is not sung, its themes and relation to the story never disappears. As for the other songs, they vary greatly in their importance to the story, some are here just for comedic value while some plays an intricate value in the role they have to play, or in their style as it englobes different genres of music, from the dynamic pop song to a ballade but also reggae. It would be very hard for me to talk about all of them but the most memorable for me is “Hoshi wo taberu” by tama. “She was as beautiful as a porcelain doll on that day. Like a bubble, it seemed like she would float away and disappear. So I watched her as often as I could, while pretending to look at the fish”. That’s how the song begins, I consider it to be a perfect symbol of their frienship being immortalized, it acts as a sort of climax for their friendship while being a nice foreshadowing of the end of the movie by the presence of the train of the galactic railroad which is smart considering how they can be close to Giovanni and Campanella. I’d say overall kinda felt close to Fantasia, even though I believe nothing can even come close to that, but the way to tackle the narrative and to be a visual wonder and a treat for the eyes certainly makes it special to me. While I don’t know the degree of involvement of Masaaki Yuasa on this project, it seems pretty clear how it could have affected him and I see it as one of his first step into creating Mind Game. This movie might not be perfect but it did an important job for me on the emotional level with its portrayal of childhood and all its hardships. It captures everything that makes our childhood a great adventure as well as an interesting on the relation of children with with art. If I had to really compare it to another movie to give you an idea of what it’s like, “My neighbors the Yamada” would come to mind as the perfect example of associating a seemingly simple structure and artstyle that finally gets you hard and leaves you an everlasting heartwarming memory when it’s over. Is there anywhere to watch it online?